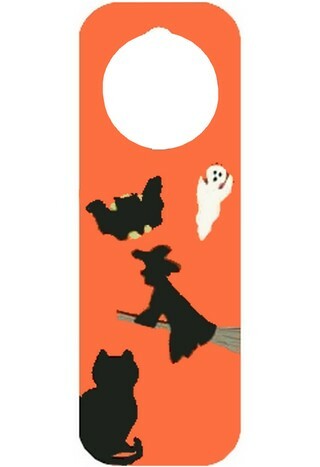 Craft foam Halloween door hanger with Halloween silhouettes. This Halloween door hanger from craft foam is an inexpensive and easy to do craft! Just print out the full-size image templates below, trace around them and cut out of craft foam (or construction paper; or whatever you have handy), and create your own Halloween doorhanger designs. If you are really in a hurry, just use the printed shapes straight from your computer printer to decorate your door hanger – it’s up to you! The pumpkin image, seen at right, is the cut-out from the door hanger. It is a 2-1/4″ circle with an slight outward curve at the top to help the project hang properly. Cut this circle out carefully as you make the hole for the door handle – and save the part that you remove because, as you can see, it makes a great little pumpkin when you add a permanent marker face. The door hanger template itself is simply a 9″x3″ fun foam rectangle with the corners rounded off. You can cut four of them from a single 9″x12″ orange sheet of craft foam. Print out this page and use the full-size images seen here as templates for your own fun foam silhouette cut-outs. Alternatively, just cut each printed image out, either the Halloween Cut Outs, or Witch and Cat images, and glue into place on a craft foam or wooden door hanger.